with the weekly challenge at Inspiration Avenue. Never been THIS late before...but finally here I am. and all the icky water cleaned up. for Tea Time, since I am the host this week. and each one is fabulous! What a lovely painting! So fresh and whimsical. I love it. Hope you don't mind but I went ahead and drew up the challenge results thinking something may have kept you from doing so. hugs! I am in total awe this is just incredible. Well done Maggie. So gorgeous. I'm making you a cup of tea as we speak (and as I'm a Brit it will be done properly... I've heard all about that dodgy tea you have over there....)!! Late or not, this is a gorgeous piece. 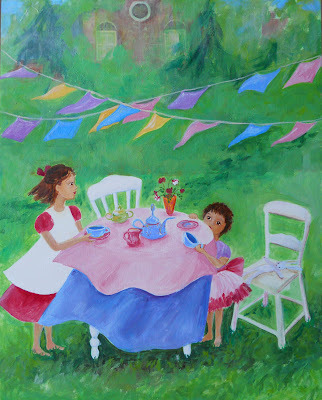 The flags, the little girls and their tea party all come together to make a fun and joyous painting. I hope you managed to get all that paint off your newly redone floor. Wow, and I am usually always the late one! Glad you made it because I LOVE your entry. It is so beautifully done that it takes you right into the picture to a childhood memory of a tea party! Beautiful colors, just the whole package! I LOVE your tea party- it's wonderful! And I bow in awe to how well you did the background area- landscapes just escape me- can't seem to get a handle on the perspective! Wonderful breezy summer feeling to it. Makes me want to have a tea party but too hot right now!